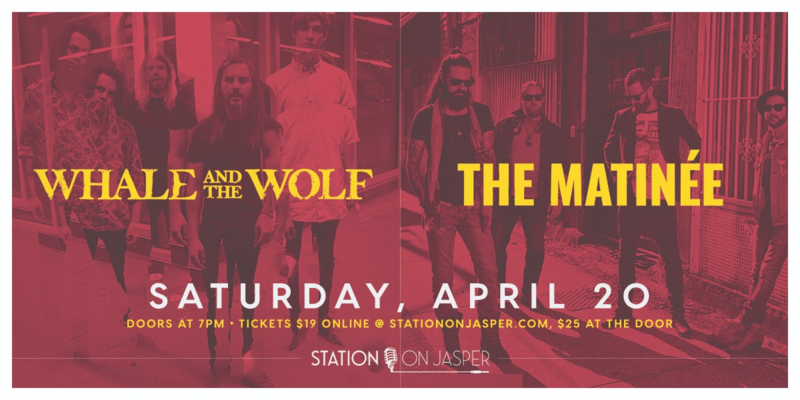 Station On Jasper presents a fantastic co-headline show with Whale and the Wolf and The Matinee. Every great story is like a long winding road, no matter where it leads, it has to start somewhere. It’s been a decade since singer Matt Layzell and guitarist Matt Rose spent a few hazy days writing songs in a rustic cabin on British Columbia’s Sunshine Coast. Since then, The Matinée has evolved from its humble origins, navigating their own route, to become a powerhouse roots rock band with a following spread across North America. Having spent years logging miles in the tour van and dropping sweat on stages near and far, the four-piece — which also includes drummer Peter Lemon and guitarist Geoff Petrie — is making its most electrifying statement yet with their sophomore album Dancing on Your Grave. Whale and the Wolf's music spans deep and treacherous ground, making it difficult for them to hide the genuine thrill and enjoyment felt with each live performance. Refusing to let a single show pass without spilling their guts across the stage, the band continues to leave their audience thirsting for more. Share in the lust and love that is Whale and the Wolf. In 2015 the band released their debut EP charting 3 singles in the Top 40 for Canadian Active Rock. Two years later, after working with Danny Craig (Default), Whale and the Wolf released their latest single "Touch" slotting as high as #25 in Canadian Active Rock. The song was featured on one of Alan Cross' Top 11 playlists, and has received radio play on over a dozen radio stations across Canada. With over 20 cities under their belt in 2017 alone, the band then accompanied One Bad Son on their Western Canadian swing of their "Made in the Name of Rock n Roll” tour where they filmed a portion of their music video for "So It Goes." A tour video documenting the band’s travels across Canada, showcasing different cities along the way. That single would reach #44 in Canadian Active Rock.